In the aftermath of the dismal outcomes of the Copenhagen climate summit, US chief climate envoy Jonathan Pershing was quick to blame the failure on the UN's inclusive approach and proposed that some future meetings should be restricted to major countries. “[It is] impossible to imagine a negotiation of enormous complexity where you have a table of 192 countries involved in all the detail,” Pershing argued, adding that “We are not really worried about what Haiti says it is going to do about greenhouse gas emissions.” For the US, apparently, too much democracy and inclusion is a bad thing. Bolivia, which along with 160 countries, had been excluded from last-minute talks on the Copenhagen Accord took the opposite approach at the recent World Peoples' Conference on Climate Change and Rights of Mother Earth held in Cochabamba, 19-22 April 2010. The resonance of Morales' call was demonstrated just four months later, when instead of the expected 10,000 people, over 35,000 people from 140 countries including representatives of 48 governments arrived in the city of Cochabamba in Bolivia for an historic debate on how to confront one of the greatest crises the world has faced. The main work of the conference was carried out in 17 working groups covering issues within official UN negotiations such as Kyoto Protocol, Adaptation, Forests as well as critical issues that are not currently part of negotiations such as agriculture and food sovereignty. These working groups developed concrete proposals including demands for developed countries to reduce carbon emissions by 50% by 2017, a draft declaration for Rights of Mother Earth (or nature rights), the establishment of a Climate Justice Tribunal to provide some legal sanction against governments, individuals and companies that contribute to climate change, a call for the recognition of climate refugees within all international refugee conventions, the rejection of transnational extractive industries on indigenous lands, and provision of financial resources of up to 6% of GNP of developed countries for adaptation, technology transfer, capacity building and mitigation. At the forefront of the working groups were an impressive number of grassroots activists from every corner of the globe involved directly in the struggle against climate change. These community leaders were clearly empowered by taking part in a constructive and participative process of developing proposals for tackling climate change. Taking an inclusive consultative approach on a crisis that has as many perspectives as there are Parts Per Million of greenhouse gases in the atmosphere certainly had its challenges. The experience of the Internet working groups in the run up to the conference quickly revealed the problems of giving as much space to one eccentric individual as a well founded network with a developed position. Working groups such as the one on Forests had serious political divergences, for example over the controversial market-based UN programme Reducing Emissions from Deforestation and Forest Degradation in Developing Countries. There were also tensions between diverse cultures of civil society based on different languages, different forms of political accountability and different strategic approaches. Moreover, despite the language of inclusion, the Bolivian government was not immune from its own politics of exclusion, demonstrated when they prohibited a number of meetings within the summit which critically examined Bolivia's own record on environmental issues. The government argued that the national focus was not pertinent to a conference focused on international climate issues where the chief responsibility for the crisis lies with the industrialised North. Ironically however their attempts to exclude what became known as Group 18 actually gave the group added visibility. It also highlighted the very important discussion on how to resolve contradictions between the Bolivian government's rhetoric on “living in harmony with Mother Earth” with the environmental damage caused by Bolivia's continued dependence on fossil fuels and mineral extraction. While these issues pose serious dilemmas for an impoverished country which in recent years has made significant progress in redistributing wealth from the nationalisation of gas resources, they highlight at a micro level some of the key debates that will need to take place worldwide as we seek to remove our dependence on fossil fuels. However, these controversies ultimately highlighted the power of Bolivia's inclusive call, rather than detracted from it. The thing about an inclusive approach, and the reason why countries like the US are so opposed to it, is that you don't control the conversation. As a result, both inside and outside the conference, there was a vigorous debate on every aspect of climate change policy. This debate is bound to continue. Yet despite vigorous debates and differences, it was impressive to see how international movements in Cochabamba succeeded in constructing consensus around radical proposals emerging from every one of the 17 (or 18) working groups. Critics of the conference have said that the conference proposals will have no bearing on official negotiations and have tried to relegate it as a left-wing talking shop. Much of the mainstream media chose to ignore the conference almost entirely, given that no major economic powers were present. The perceived wisdom, reinforced by individuals such as US climate envoy Pershing as well as many liberal commentators, is that the only solution for climate change will come from a stitch-up between the US and a few major powers, and that the views of the world's majority are irrelevant. However political and media elites' attempts to dismiss the power of Cochabamba more likely shows their naivete or political blindness rather than that of the social movements. The Peoples' conference on climate change showed that a global movement, much larger than anyone imagined and with firm proposals, has coalesced and gathered strength. Led by people on the front lines of climate change, from India to Alaska to Africa in alliance with scientists, researchers, artists as well as developing country states like Bolivia, Cochabamba unveiled a significant international movement determined to develop proposals that tackle the root causes of climate change. The proposals may seem radical to some but are ultimately effective proposals to preventing runaway climate change. Many social movements are already working to enact these proposals at local, regional and state level in a myriad of ways from blocking coal plants to developing organic agriculture and will continue to work on real solutions regardless of whether they are taken up by the UN. As one of the banners at the conference summed up: Nature doesn't do compromises. We either live within the limits of the world's bio-capacity or we don't. 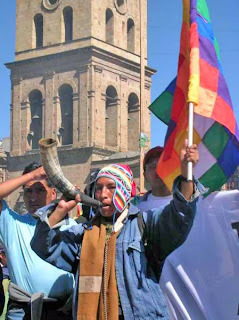 While the world's most powerful political leaders ignore this message in favour of policies of weak compromise, empty commitments and exclusion of the majority of the world's people, the movement present at the historic Cochabamba conference offers one of the main hopes that humanity can effectively address the climate crisis. Nick Buxton is TNI Online Communications and Media Officer. He has been based in California since September 2008 and prior to that lived in Bolivia for four years, working as writer/web editor at Fundación Solón, a Bolivian organisation working on issues of trade, water, culture and historical memory. He is a long-term activist on global justice and peace issues. In the late 1990s he was communications manager at Jubilee 2000, part of the global movement that put unjust international debt on the global political agenda. His publications include: “Networking for debt cancellation” in Advocacy, activism and the Internet (Lyceum books, 2001); “Civil society and debt cancellation” in Civil society and human rights (Routledge, 2004) and “Politics of debt” in Dignity and Defiance: Bolivia’s challenge to globalisation (University of California Press/Merlin Press UK, January 2009). Thank you for this insightful analysis of Bolivia's climate change summit. You make a great case for the value of inclusivity, and I appreciate your exposing Morales's desire to veil Bolivia's own environmental issues. I applaud the audacity of Morales to hold this follow-up conference and to show the world what real democratic global governance looks like.